This is my friend Jessica. 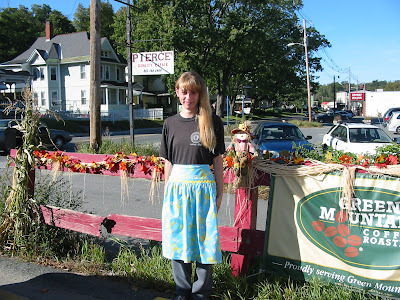 Jess is a good sport to model my aprons! Thanks, Jess. 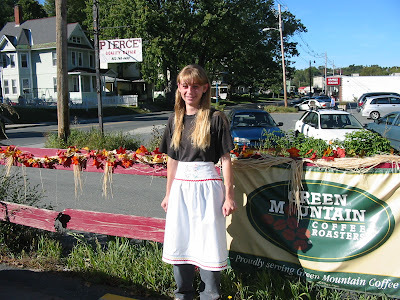 This is the white embroidered apron, great pic of Jess but you can't see the embroidery. Love that cute smile, just had to include it! The blue apron. I made the pattern myself and I was glad to see that it fit someone as petite as Jessica. But wait a minute, it also fits me and I am, well a sturdy size 14 (oh my.) So I am happy with the way the apron fits all sizes. 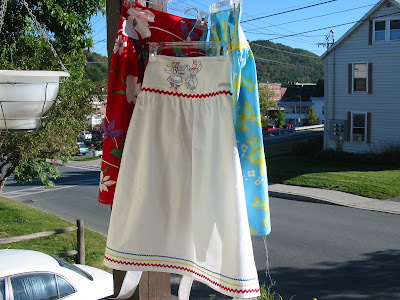 Here are the original 3 aprons in the afternoon sun on the front porch. Now that I know they fit everyone, they have magically multiplied to 20 aprons. Turkey Feathers so kindly made these folk dancers available to those who visit her fabulous web shoppe she calls Patternbee. The minute I saw them I could feel the music. Aren't they a happy couple? 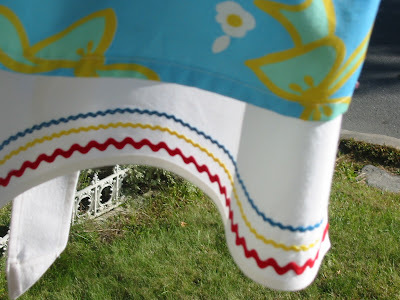 If you are looking for vintage embroidery patterns Patternbee is the place to go, where you can find hundreds of old patterns reprinted as new iron-on transfers. You can get the folk dancers for free here, thanks to Turkey Feather's generosity. Do some shopping, too! Aprons are IN! 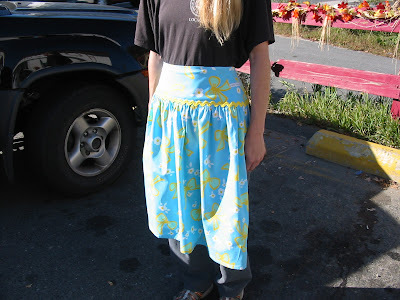 I am having a wonderful time reading apron blogs . . . of course, I am so suggestible, just mention something to sew and I want to try too! HAPPY SEWING . 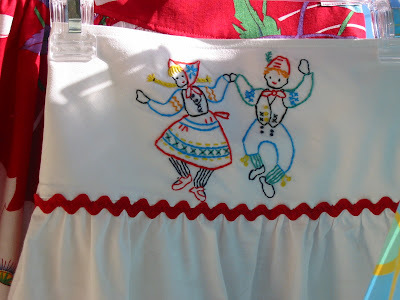 . .
Gorgeous aprons Meg, and I LOVED the embroidery. Oh, I love the folk dancers! Extremely cute, Meg! 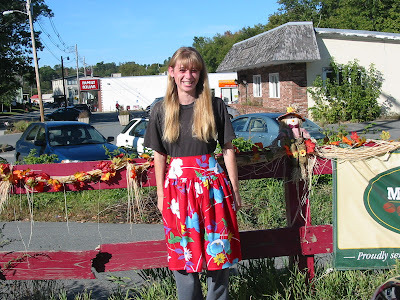 It's a great apron pattern- maybe you should reproduce it and sell patterns. I love where the waistband sits. You have inspired me to get the sewing machine out. Fantastic Meg - love the embroidery and the ric-rac. Your town looks beautiful - I'd love to see some more pics of it. Your PIF is underway honey - just waiting for this long week to end. 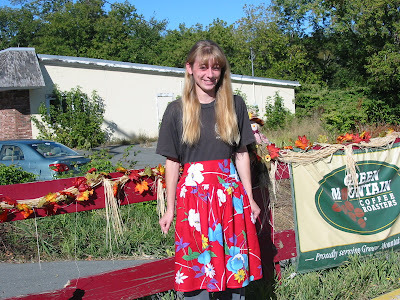 Your aprons are gorgeous and so perfectly modelled!